Piqua’s Decker Jackson chips on to the green against Troy Friday. 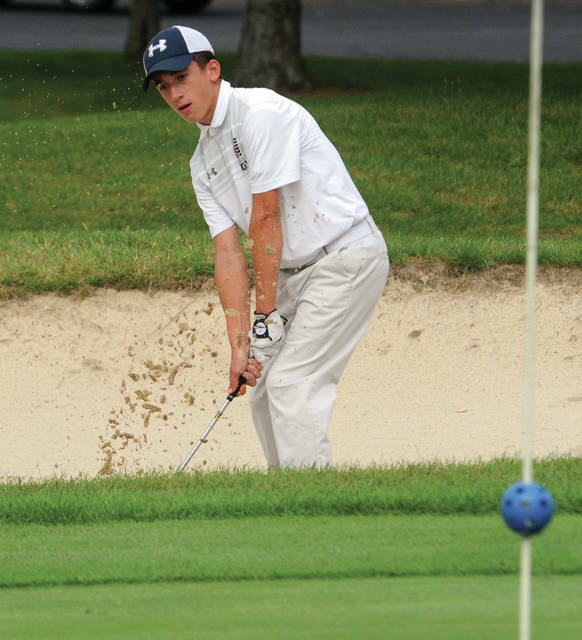 Mason Price of Piqua aims for the pin as he hits out of a bunker at Echo Hills on Wednesday. The Lehman Catholic football game with Ridgemont is Saturday not Friday and will be played at 7 p.m. at Alexander Stadium/Purk Field. The Piqua boys golf team lost to Troy 154-192 on the front nine of Echo Hills Wednesday. Matt Herron led Piqua with a 45. Other Indian scores were Decker Jackson 49, Jackson Huelskamp 49, Christian Starrett 53 and Mason Price 54. 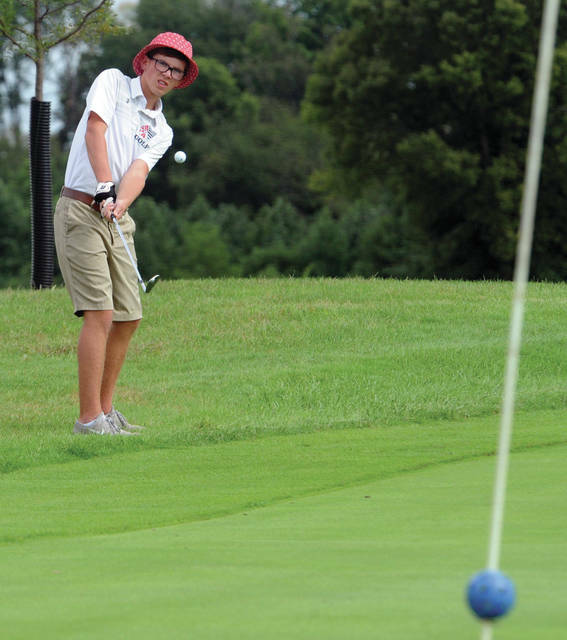 WEST MILTON — The Newton boys golf team won a tri-match with Tri-County North and Arcanum at Stillwater Ridge Golf Course Wednesday. Team scores were Newton 171, Tri-County North 183, Arcanum 193. Chet Jamison led Newton with a 38. Other Indian scores were Garrett Peters 43, Ross Ferrell 44, Nate Zielinski 46, Ryan Mollette 49 and Kleyson Wehrley 51. Jack Shell was match medalist with 45 to lead Covington. Other Bucc scores were Grant Humphrey 46, Hunter Alexander 49, Dylan Lucas 51, Job Morgan 51 and Thomas Kuether 53. ST. PARIS — The Miami East girls golf team defeated Tippecanoe 201-203 Wednesday at Lakeland Golf Course. Miami East, 7-3, was led by Paige Lawson with a 45. Other Viking scores were Marissa Kearns 49, Kearsten Kirby 51, Katie Pottorf 56, Maci Krites 60 and Erin Baker 63. CASSTOWN — The Miami East girls soccer team defeated Twin Valley South 9-0 Wednesday. Meadow Poers had four goals and Cerstin Gross added two. Also scoring goals were Whitley Gross, Chloe Aviles and Morgan Hamby. SIDNEY — The Lehman Catholic girls tennis team lost 5-0 to Lima Shawnee Wednesday. In singles, Claire Larger lost 6-1, 6-0; Sarah Gibson lost 6-1, 6-2; and Angela Brunner lost 6-0, 6-0. In doubles, Keira Burns and Ann Pannapara lost 6-0, 6-1 and Shannon Staley and Brieanna Werling lost 6-1, 6-0.